Duck & Waffle, on the 40th floor of the Heron Tower in the City of London, was begging me to hate it. There were the usual stupidities of booking – email address, please; you can only have the table for as long as we permit; give us your first name, the bank account number of your third cousin – and the less-common stupidities of there being no sign for the place at ground level. There was the self-satisfied glimmer of the meeters and greeters and the waiter who insisted on explaining the menu – if a menu needs explaining something has gone wrong. And yet… and yet… Duck & Waffle is like that irritating bloke you see propping up the bar in his flash suit, with his £1, 000 shoes and over-whitened teeth who seems horribly pleased with himself until you get talking to him and discover he's actually quite nice and has lots to say for himself. It sits above the latest outpost of a chain called Sushisamba which I do actually hate, and I haven't even eaten there. I don't need to. It's a fusion of Japanese, Brazilian and Peruvian food, which is the sort of thing that makes me want to punch people, regardless of the interplay of the various national groups over the centuries. Even the name is a culinary non sequitur. Sushi is all "precise" and "delicate", samba is all "look at my arse" and "don't you want to do me". I stood for a few minutes in the dining room. It's full of the sort of people who hate sushi and really want a grilled-chicken salad. It has an open terrace which will only be usable for four weeks of the year and which is surrounded by an easily leapable glass barrier – risky, given the way things have been in the City recently. Then again, a cull of bankers isn't such a bad idea. Anyway, don't go there. It only encourages them. Instead go upstairs to the quieter Duck & Waffle with its bejewelled views over London like a shameless plunge of shiny moisturised cleavage and the menu of drunk's food. 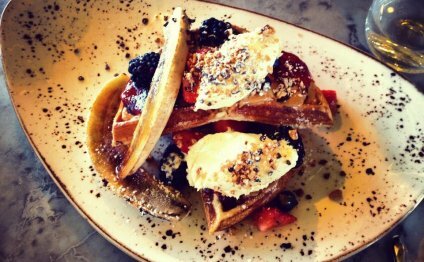 The title dish is two fluffy waffles with a hunk of crisp-skinned duck confit, a fried duck egg and a pitcher of spiced maple syrup. It's the sort of thing you'd only want to eat if you were so bladdered you felt the need to keep clicking your tongue against the roof of your mouth to see if your brain could register the movement. They also sell strips of crispy pig ear seasoned with sugar, salt and a few spices. It makes them taste like Frazzles, which is obviously genius. They come in brown paper bags. We ordered a second bag and only didn't order a third out of shame.